Located one hour Southwest of Denver via Highway 285, Park County, Colorado's last frontier. Click here to view map. 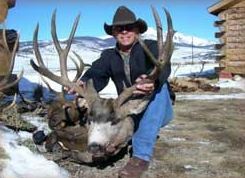 Cowboy Camp Outfitters, Inc. is an equal opportunity service provider and a permittee of the Pike National Forest and Bureau of Land Management. The ranch and adjacent permits on the Pike National Forest, BLM, and State Wildlife Areas are in Game Management Units 50, 500, and 501. These are limited license trophy draw units for deer, elk, antelope and black bear. This combination of private land and limited draw provides the very best opportunity for bagging trophy animals.